Company Formation MadeSimple has now formed over 400,000 UK Limited Companies. That means we have the name, address, nationality, date of birth and occupation for a huge amount of company directors. 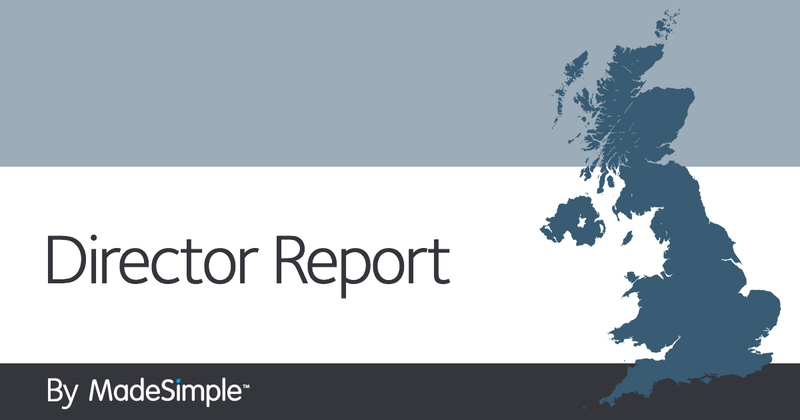 Information that’s pretty handy when trying to visualise who is behind the UK’s startup boom. So if you’ve ever wondered what the most common name for a director is, what starsign is the most entrepreneurial (who hasn’t? ), which nationalities truly embrace the startup spirit, and more – read on. The following is based on 240,000 limited company directors (appointed at incorporation) between 2012 – 2014. No surprises here with all the first names being taken up by traditional British names. However, if there was one standard spelling for Mohammed the name would appear at number 2 on the list of male first names (Mohammed is currently the most popular baby name for boys in the UK). Multiculturalism also shines through in the surnames, with six of the top ten male names being of non-UK origin. If you are a male director there is a 2.82% chance that your name is David. If you are a female director there is a 1.5% chance that your name is Sarah. Whilst we can’t tell you what the most common name in the UK is now, we can look back 34 years (the most common age for our directors) and tell you that David was the 4th most common male name and Sarah the 5th most common female name (Michael and Jennifer were the most common). My Lords, Ladies and… Venerables? Set aside the more run of the mill titles such as Mr, Mrs, Ms, Masters etc and we have: 4000 Drs, 77 Lords, 3 Ladies, 3 Reverends, 1 Air-Vice-Marshall, 1 The Honourable, 1 The Venerable, and our favourite; 1 Princess. This section examines the ratio of males appointed to females. For this information we looked at the title of each appointment. Non-gender specific titles, such as “Dr” (1.7% of the directors), were disregarded. This section examines the ratio of males appointed to females in different nationalities. 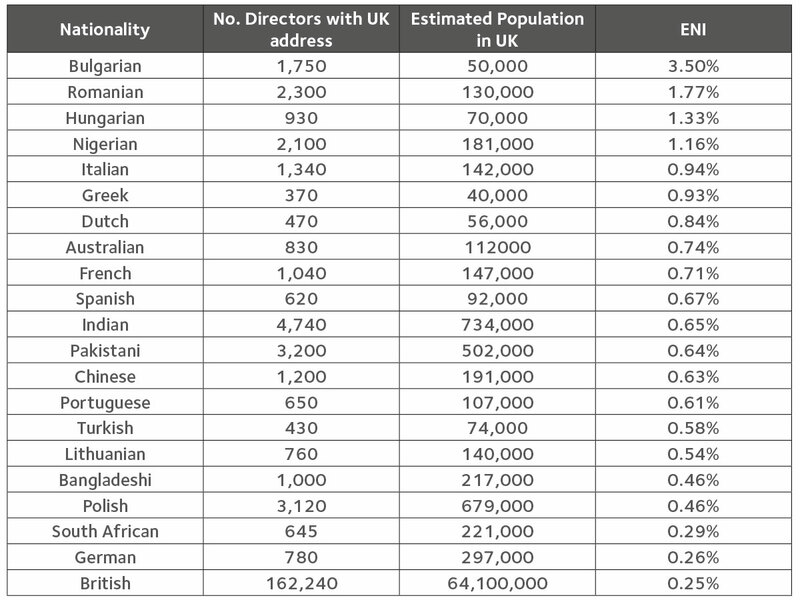 To qualify each nationality needed a minimum of 100 directors. The most common ages for our directors were (in order): 34, 42, 33, 43 and 41. Our three oldest directors were 113, 110 and 101 (16 is the minimum age for a director). This section examines the residential address of the directors. We’ve defined London (areas with a standard N, S, E, W, SW etc postcode) as one place. Greater London has been split up. Welcome to Manchester, Harrow, Ilford, Twickenham and Southall. Farewell to Guildford, Newcastle, Southampton, Tunbridge Wells, Leeds and Milton Keynes. China continues to be the most popular location for our overseas directors (as it was in 2010 and 2011) whilst Spain has ousted France to take second place. Hungary and Switzerland take Ireland and Australia’s places in the top 10. Have you been inspired to become a director? Change your life today and take a look at our different company formation options.